Sadness is the expression of sorrow or unhappiness. Despair however is the complete loss or absence of hope – this is a more accurate description of how I felt after spending 3 weeks in September eating my way through the BBQ pits and smokehouses in the southern states of America and returning back home to Sydney. Don’t get me wrong – the first thing I did was head to Excelsior Jones for a piccolo, but I realised that the smoke infused, meaty goodness that I had become all too familiar with, was about two flights and 20 hours away. Sure, Hurricanes, Ribs and burgers and Outback Steakhouse give it a good crack but none of them have been able to lock in that smokiness which really gives the meat that signature BBQ pit taste. In steps Dan Hong backed by Justin Hemmes. 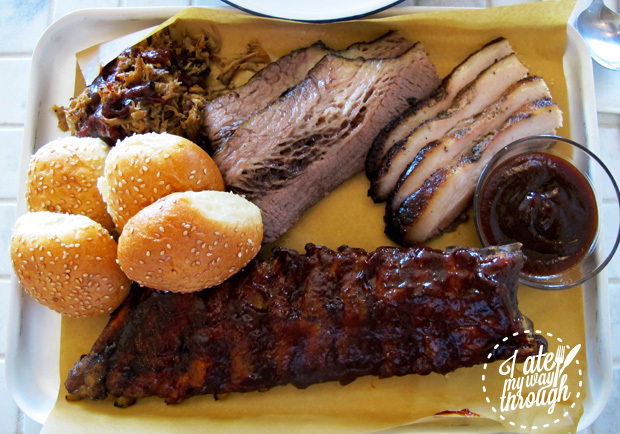 When I read that The Merivale group was opening an American BBQ Smoke house which was going to be done “right” after Dan had been to the south, I felt a renewed sense of hope. With the kitchen lead by Christopher Hogarth (El Loco) and Patrick Friesen (Ms G’s) it was set to open on the 31st of December. However I was told about an unannounced soft opening that was happening a few days earlier. Eager to beat the crowds and lines that would inevitably happen once Papi Chulo opened, I jumped in my car and made the journey to meat mecca. 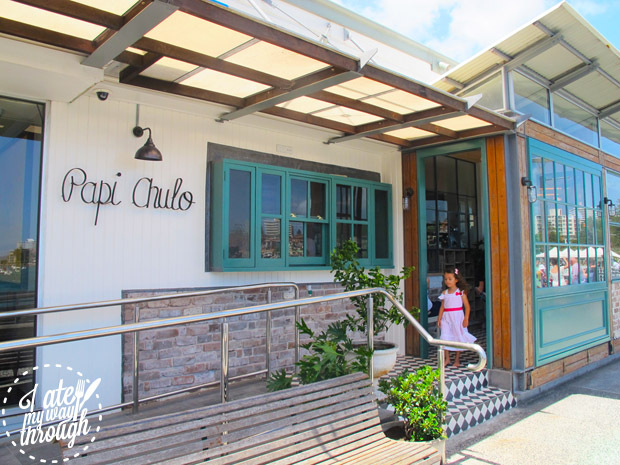 As always you can rely on the Merivale group to deliver top notch fit outs and Papi Chulo doesn’t fall short of expectations. A beautiful mix of brick, wood and tiles make up the interior but I don’t really care about it too much once the food arrives. Throughout our holiday in the South, Sarah always ordered the fish sandwich – if it was on the menu she would order it. So needless to say when she saw the Tennessee-style hot fish sandwich ($18) on the menu it was a no brainer for our starter (anyone else order mains to start?). 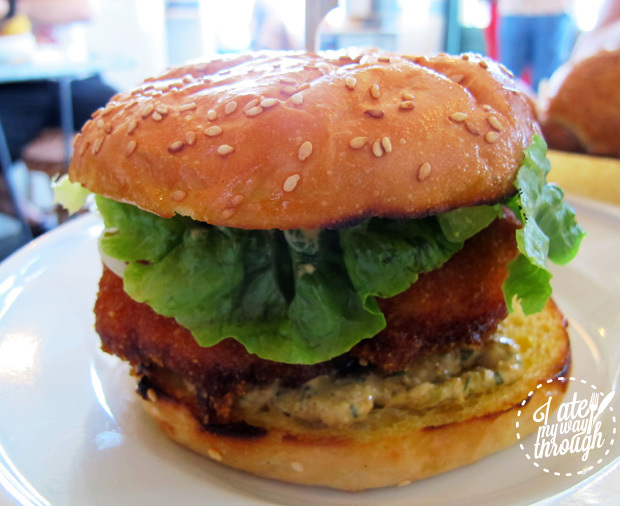 The spicy corn meal coating on the fish is distinctly Southern and provides that firm crunch as you bite into the soft steamy fish fillet that is sandwiched between a soft bun. The fish sandwich has a nice little kick to it but could use a little more to match Bolton’s Spicy fish sandwich (Nashville) which is arguably the best fish sandwich in the world – though I doubt most people could handle the heat. For $18 I would have liked to see some potato skins or coleslaw on the side but believe me this fish sandwich is legit and you should eat it… imagine a filet ‘o fish on crack – get my drift? Starting with the pork ribs they are so tender and pull apart with ease. Many restaurants will par cook ribs and finish them off on a grill or in the oven, however most restaurants don’t have massive smokers like Papi Chulo where everything from the BBQ section has been cooked “low and slow” for at least 6 hours. The difference is when you sink your teeth into the ribs and get a hit of smoke which has been infused into the meat and adds so much more to the flavour profile. 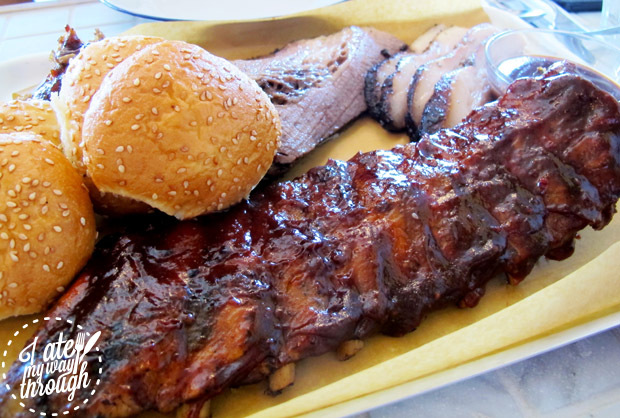 If you’ve never had smoked ribs before then it’s going to be hard to go back to Outback. Who doesn’t like pulled pork? Where was pulled pork in Sydney 5 years ago? 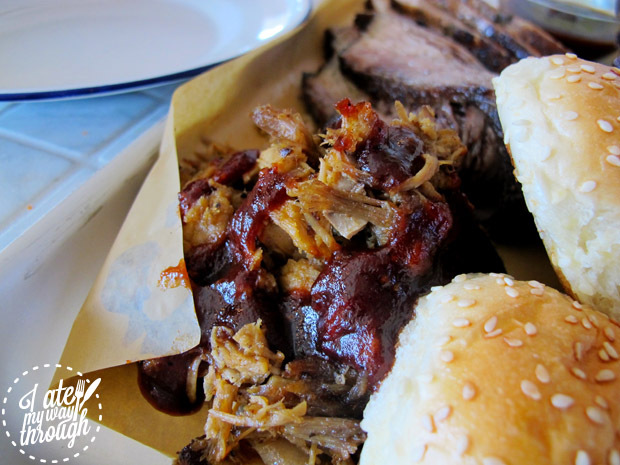 Seems like everyone has had a pulled pork now and I’ve had my share of good and bad; but you couldn’t have a BBQ smokehouse without pulled/chopped pork and Papi Chulo doesn’t disappoint. The tangy BBQ sauce has just enough kick on it to really complement the flavours of the pork, just dump it on there and enjoy. My favourites of the platter are next but this gets a solid thumbs up. The next two were my favourites of the day; the smoked wagyu brisket and the smoked maple black pepper pork belly. Starting with the pork belly (right), this one here bears no resemblance to the ones you get served at your local gastropub. There is no sight of pork crackling *gasping noises and dropping of forks* but that’s a good thing because the flavour you get from smoking pork belly is a great change from the good old roast. People on diets beware because the best part about the pork was not the juicy meat but the gloriously smoky, peppery, luxurious layer of fat that sits atop. 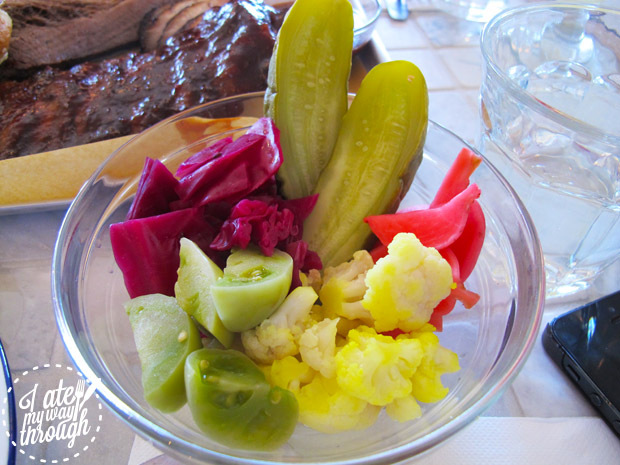 If you are the type to cut away the fat from your meats then you’ll miss out on something special – it’s like going to Paris and not eating a baguette or New York and not eating pizza… but everything in moderation as they say. My absolute favourite of the day was the smoked wagyu brisket (left). I can’t say it enough but the smoked flavour that has been jammed into the brisket is really amazing and being wagyu it has great marbling which makes every bite #sojuicy as it renders down in the smoker. It was melt in your mouth tender which is not the easiest of tasks for beef if it’s not been stewed. 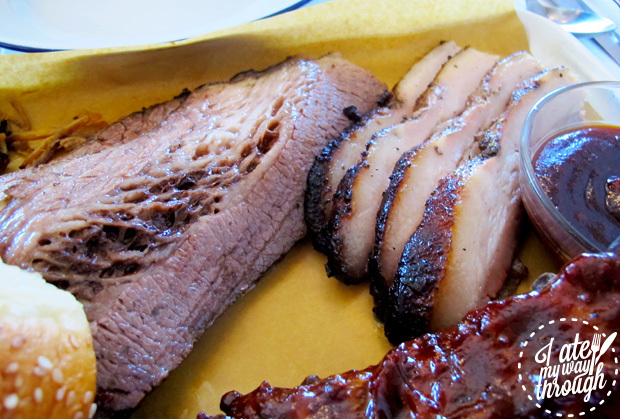 Beef brisket is one of my favourite cuts when done right and they certainly do it right at Papi Chulo. Next time I’ll probably just get a big old plate of smoked brisket and wear my most presentable track pants and not even care. About now I was ready to roll back into my chair and have happy dreams until I heard the 5 magic words, “would you like some dessert?” The appropriate answer for this kind of question is always yes for those who are left wondering. 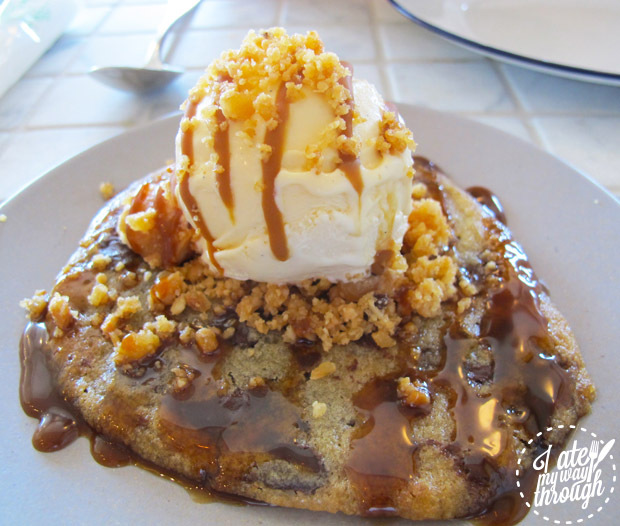 They have 3 desserts on offer and when asked, our waiter recommended the warm chocolate chip cookie with vanilla malt ice-cream, butterscotch sauce, macadamia brittle ($14). It was a nice end to round off the meal with something sweet, but for me the combination of all the above was just too sweet, though if you happen to have a sweet tooth then I’m sure you will be very happy. I’ll probably go with my gut next time and get the tres leches cake and I have to say $14 is a bit too much to ask for this particular dish in my opinion. So how do I feel now after eating at Papi Chulo? Am I still in a state of despair where I want to knock ice cream cones clean out of the hands of little children? Or where I want to stand at the door of a gym eating fried chicken? In a word – nope. Papi Chulo delivers on all aspects of what makes a good BBQ smokehouse and I will definitely be returning to eat my way through the rest of the menu. So now that I’ve found my “holiday food fix” let me ask you – what is that one dish you’ve had overseas which you can’t get at home? David has worked professionally in the Food & Beverage industry for over 7 years as the head of marketing & development in an international hospitality group. At the moment he's enthralled with skin-contact wines (try them if you haven't) otherwise David will be in a kitchen recreating & experimenting with both celebrated and contemporary dishes whilst curbing his addiction for sneakers and Japanese chefs knives.